﻿ LOWFI Holyland Bible Exhibition tour this Saturday! We have been invited to Holyland Bible Exhibition, an absolutely unique and bizarre repository of Biblical knowledge, this Saturday. Betty, the caretaker and guide of the property will give us a talk on the Bible and the old Testament, complete with Paul Laffoley-style charts and diagrams from the 1930s, a tour of the rooms full of antiquities gathered by founder A.J. Futterer (who was the real-life inspiration for Indy's adventures in The Raiders of the Lost Ark), perhaps punch and cookies, and a visit to one of the most interesting gift shops this side of Jerusalem. The Holyland Exhibition was built in the late 1920s as an educational center and museum; the two-story complex houses an incredible collection of Egyptian, middle Eastern and Biblical items. 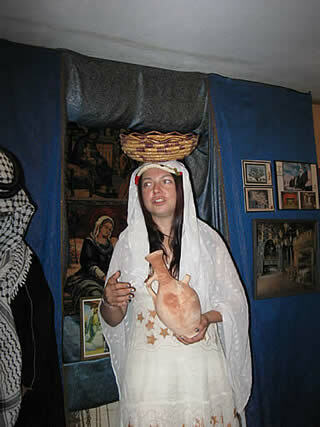 The Bible Art and Archaeology Room has stones, pottery and other items from Nazareth, Bethlehem and the Jordan River. Travel back in time with us and brush up on your ancient history, religious studies, geography and archaeology! left on Allesandro St.; right on Oak Glen Pl. ; right on Allesandro Way. left; Oak Glen Pl., right; Allesandro Way, right, to corner of Allesandro & Lake View. After the tour, those who are interested will head down to Echo Park Lake for the Lotus Festival. Please, kids, RSVP to me and let me know if anyone is interested in carpooling!